Puzzle Fight? Them’s Fightin’ Words! In this blog, I try to talk about puzzles in all their forms. We’ve explored everything from puzzle games and mechanical brain teasers to pencil-and-paper puzzles, from riddles and deduction puzzles to escape rooms and puzzle hunts. That covers a pretty impressive swath of puzzly varieties. Naturally, I’ve spent some time talking about puzzle apps as well. Not only our own marvelous offerings — like Daily POP Crosswords and Penny Dell Crosswords App — but others as well that’ve piqued the interest of our in-house app reviewer, Sherri. 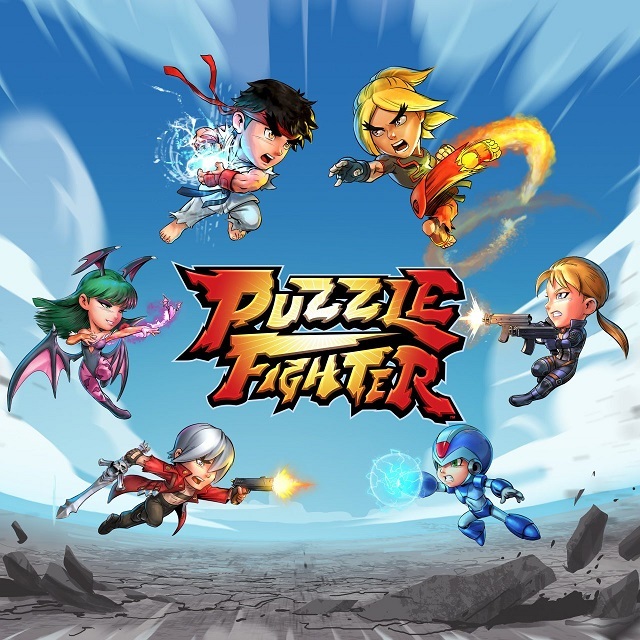 And today, I’d like to return to the subject, because there’s a curious subset of puzzle apps that I didn’t even know existed: puzzly fighting games. Now, your standard fighting game has a simple concept: two fighters go head-to-head in a match, and the first to drain his opponent’s life bar wins. There are numerous famous fighting games across many video game systems. Franchises like Street Fighter, Mortal Kombat, Soul Calibur, Tekken, Dead or Alive, Darkstalkers, and Marvel vs. Capcom have built devoted followings with eyecatching fighters, innovative attack combos, and ever-improving graphics. But in a puzzle fighting game, the outcome of the fight does not depend on button-mashing skill, tricky combinations, or well-timed strikes… it depends on your puzzly talents. Take, for example, the standard bearer for the genre: Puzzle Fighter. The layout probably looks familiar. The game combines the aesthetics of Tetris — blocks dropping into a contained play area and being rotated and placed by the player — with the gameplay of Bejeweled, Candy Crush, and other color-matching puzzle games. You want to group pairs of blocks (or gems) together, because you can clear them from the play area by using “crash gems,” which wipe out any neighboring gems of that color. So, with proper planning, you can wipe out huge sections of your board. 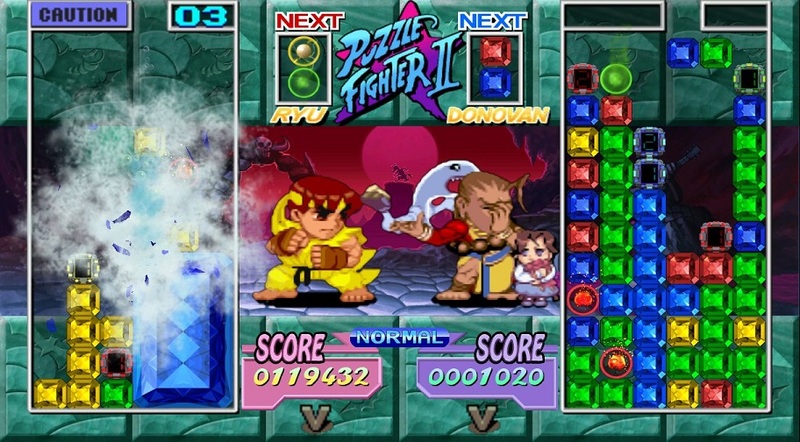 Puzzle Fighter was followed by a sequel, Super Puzzle Fighter II Turbo, a fun reference to the Street Fighter franchise, which also allows some of its characters to appear as sprites in this puzzly spinoff. There was also a short-lived WWE wrestling-related app that was more like Tetris in its gameplay, but similar in execution to the Puzzle Fighter series. It’s an intriguing idea, if only because other head-to-head puzzle games like Dr. Mario and Tetris Arena feel a touch less adversarial. In head-to-head Tetris, it’s simply who’s the better puzzler. In Dr. Mario, as you eradicate the little viruses with color-matching pills, you can also bury your opponent under pill pieces, which adds a form of interaction to the gameplay. 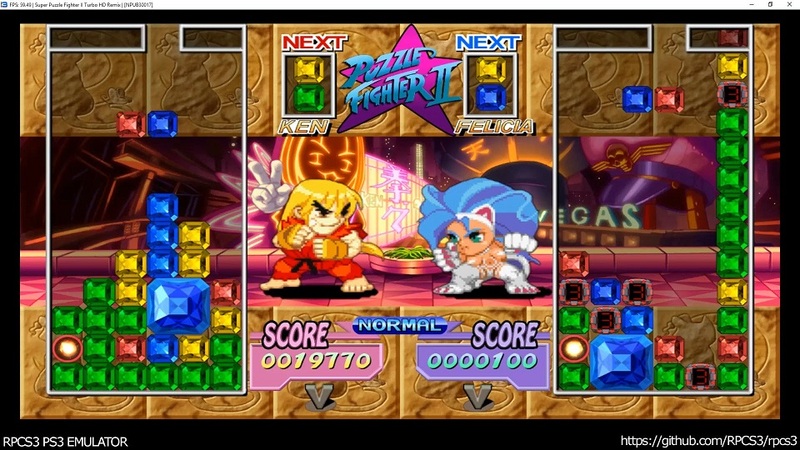 In Puzzle Fighter, the game goes two steps further. Not only are you allowed to visualize how you’re winning or losing based on the character sprites fighting above the play area, but your successful use of crash gems will send additional gems into your opponent’s play area, with only a limited amount of time to neutralize them. But an upcoming entry in the genre has added a curious wrinkle to the puzzly fighting experience: magic. 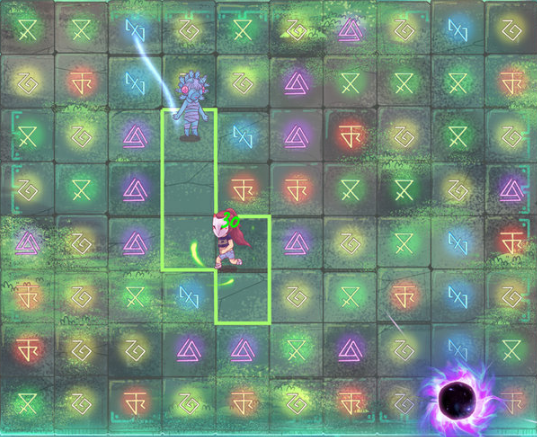 The World Next Door features characters actually running across a shared game board featuring all sorts of colored runes. Your goal is to swap and connect runes of the same color so that they form chains of runes that can be activated. 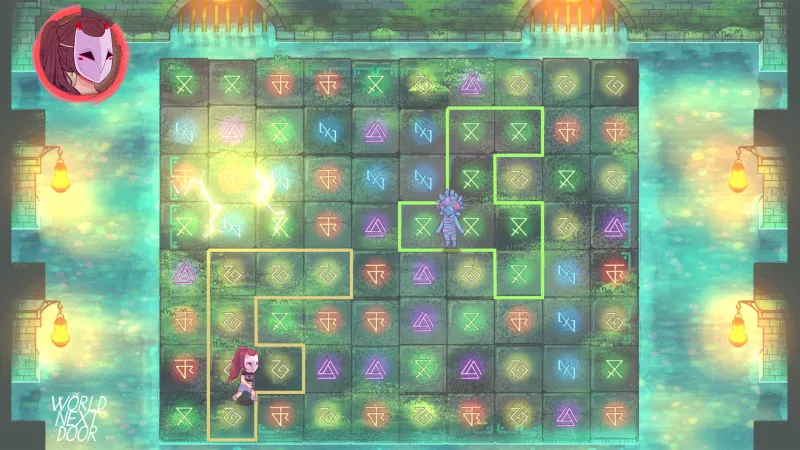 Each colored rune represents a different attack, which means that, like in Dr. Mario and Puzzle Fighter, a crafty puzzler can create chain reactions where wiping out one set of runes causes another set to connect, triggering another attack. In The World Next Door, this can lead to devastating combination attacks. Of course, since you’re sharing a game board with your opponent, there’s the additional elements of defense and sabotage. While you’re building your rune chains, you’re going to want to defend them from your opponent while also disrupting their own attempts to form chains. Defense can truly become a strong offense, if you choose to play that way. This is probably the most direct iteration of puzzly fighting I’ve encountered thus far, since you’re still using puzzle skills to make your attacks, but you’re also interacting head-to-head with your opponent’s game board AND sprite, which really ratchets up both the tension level and the challenge factor. I’m definitely interested in seeing how this relatively minor subset of puzzle games continues to evolve and grow. The World Next Door is an impressive step up in complexity and style, and with this sort of creativity and innovation at play, the sky is truly the limit. And let me know if you’d like us to discuss more puzzle apps, puzzly video games, or other related topics on the blog in the future!